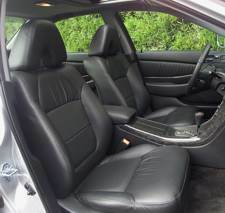 anyone ever retrofit 2000+ Acura CL/TL seats in a 4th gen? help me be one of the 1st! I want to put them into my Prelude. I've never retrofited seats before. I'm going to ask the acura zine crew for dimensions before I start sourcing a set. I'm pretty sure they're going to be too wide though. Basically I'd measure from the floor to the top of the seat, width of the seat overall, and see about a custom seat bracket if its determined that the seats will actually fit in the car. There may be more, but that's a place to start before spending any money. 2 trips to NY countless round trips from tampa to orlando to deland (daytona) to fort lauderdale and back I75 back to tampa. higher position maybe but people modify S2000 rails all the time to sit lower (i guess for the taller folk) so i'ms ure the same thing can be done for the TSX seats to fit nicely in the Prelude. Last edited by starbai; 02-10-2009 at 12:35 PM. ^are those stock fogs? what springs are you on?! I was going to get the aux for satellite radio myself. ...i have the same exact color TSX y0! I traded that TSX in for my S2000, but yes they were OEM Fog lights w/Nokyo Yellow Bulbs. 2nd gen tL seats are exactly what I'm looking at. I dont really care about leather cnodiiton beacuse i'll likely be getting them recovered anyway.